Should you give away free digital downloads? Definitely. Here's why. Giving away free digital downloads helps your bottom line more than you might think. Discover how, when, and why to create free digital goods. When people ask me what my favorite meal is, they’re always a little taken aback by my answer. Not because it’s complicated -- if anything, it’s from the simplest cuisine out there with the least amount of rules -- but because it’s not the answer they expect. Incidentally, “free” isn’t just my favorite kind of food to eat -- it’s also one of my favorite marketing strategies for online courses and digital downloads. Because free, my friends, is profitable. Free breeds brand affinity, makes your business more trustworthy, and if it’s your top-tier content, encourages visitors to join your email list so you can convert them from subscriber to customer. Plus, if you’re selling digital downloads, you already have all of the skills you need to offer a great product for free. But because I know you might be apprehensive about giving away digital downloads without a payoff, today we’ll cover why and when to give away free digital goods, talk about how they can generate profit, and go over three types of products you can create to reap the benefits. As usual, let’s start at square one. What’s the point of giving something, let alone a product, away for free? Why give away a digital download for free? 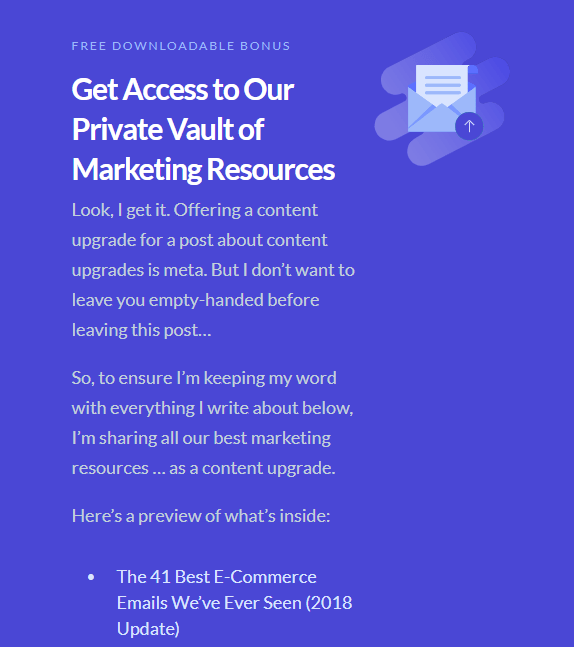 If you checked out our previous article about giving away content for free, you might think you already know the answer to this one, but unlike blog content, giving away a free digital download isn’t just about generating traffic for your products. Instead, when you create a free digital download, you’re creating a lead magnet. If you’re not familiar with the term, don’t worry. They’re actually pretty easy. Put simply, a lead magnet is anything that draws customers into your sales funnel, usually by capturing an email address. Because lead magnets are usually gated behind an email box, they’re not necessarily the best content for SEO or blogging, though they’re often seen attached to the ends of blog posts as content upgrades (more on that later). And, of course, if you optimize your sales page with a few quick-wins, they can be powerful for search traffic -- it’s just not their common objective. Lead magnets, especially if they're relevant to the paid products you offer, are primarily aimed at attracting qualified leads. ‘Qualified’ is an important word to focus on there -- 79% of leads never convert into contacts, and the chief cause of lead morbidity is a lack of effective nurturing. Which makes a lot of sense if you think about it: how can you nurture leads that aren’t right for your business? That’s why 70% of marketers say that the most central objective in their lead generation strategy isn’t to create more leads, but rather to improve the overall quality of those leads. Or it might be because the statistics behind companies with effective lead nurturing are envy-inducing for those without it. 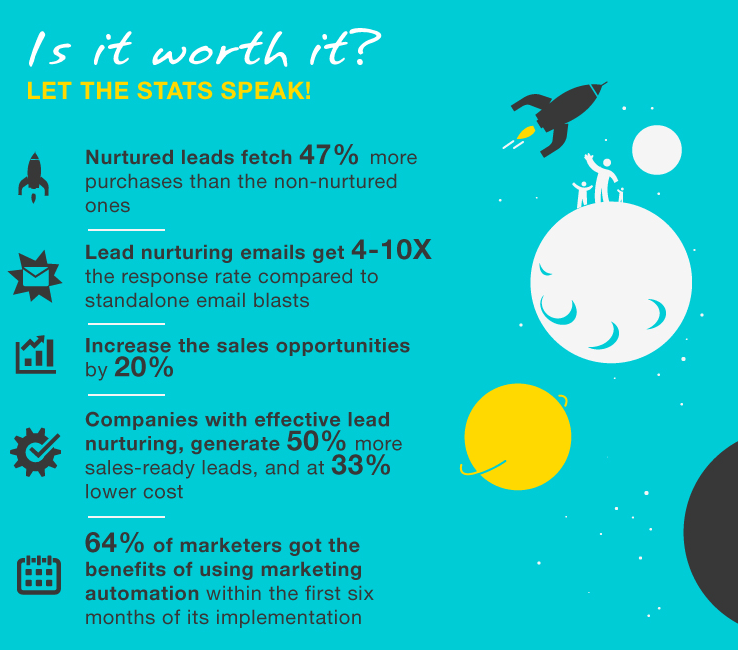 Businesses that nurture their leads effectively -- something you can only do if your leads are well-qualified -- produce 50% more sales-ready leads at a third of the cost. But how about a real-life example of a business that gave away a free digital download to great rewards? Consider the case of 24Slides, a company that designs custom presentations and slide decks at not insignificant fees. You’d think that giving away free templates would undercut their business -- after all, if people can do it themselves, why would they pay you -- but the results were anything but damaging for their bottom line. 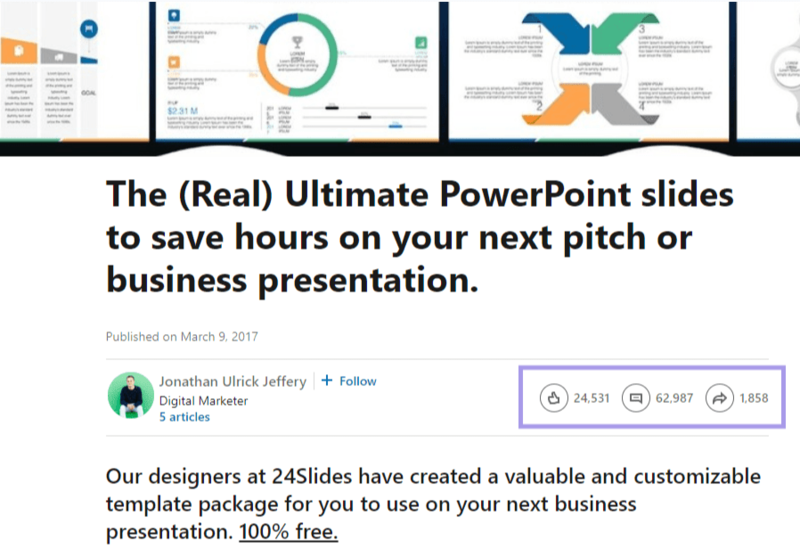 They created a 20-slide long template for corporate presentations -- something that would run $120.00 on the lowest-end of their prices -- and put it out on LinkedIn. All users have to do to receive the template is share the article, hand over their name and email, and leave a comment. All told, they report gaining 80,000 new email leads, and have replicated the campaign to grow their list to 130,000 subscribers strong. And since everyone who joined their email list has expressed an interest and need for high-quality presentations, their leads are well-qualified for the types of products and services 24Slides provides. OK, now that I hopefully have you onboard the free train, does timing matter? When should you give away free digital downloads and products? Ideally, you should give away free digital downloads or products all the time by offering them on your storefront like you see Ryan McRae, aka the ADHD Nerd, doing in this particularly meta* example. ‍*Why, yes, I do love meta examples. Of course, that doesn’t mean you can simply create one and call it done. As your business grows, your audience will change, and you’ll likely gain a deeper understanding of the types of products, free goods included, that resonate best with your prospects. Which begs the question of when should you create new free digital downloads? If you had all the time in the world, as much as possible. But since you probably don’t -- you’ve got a business to run and need to avoid burnout -- try to follow the seasonality of your industry. If you have analytics from the past year, go back and look at the months that were your highest performers and plan to release new lead magnets in advance of them. If you don’t have that information on hand, there are two workarounds (or, if you do have it, supplements). The first is to hit the major shopping holidays like Black Friday and Cyber Monday, ideally creating the product ahead of time and releasing it in the weeks leading up to the day so you have nurture time with the leads that come in. Worried about competing on those auspicious days? Don’t be. While big shopping holidays may feel like a game of corporate giants, the statistics don’t back that up. Adobe says that small business websites actually convert twice as many customers as large, big-box retailers during Black Friday. The other solution to determine seasonality is to search the trend history of your topic or niche with Google Trends. Some industries are obviously more prone to seasonal swings than others, but you’d be surprised at how much information you can get from a quick search. For instance, looking for a subject with an obvious seasonality component -- taxes -- you probably wouldn’t be shocked to see the sharp uptick in the days leading up to “tax day” in the US (April 15th). Likewise, if you sell online courses or digital downloads related to nutrition, seeing the upward swing in the New Years period for the term “diet” probably wouldn’t come as too much of a shock -- it’s the season for resolutions, after all. But even topics like “design” have an element of seasonality, with an uptick in the late summer to early winter period. Whatever the trends reveal, aim to deliver new free digital downloads in the period preceding the spike. It doesn’t necessarily have to be an entirely new product, either: you can give old products a refresh, as long as it’s still relevant to the customers you’re targeting. 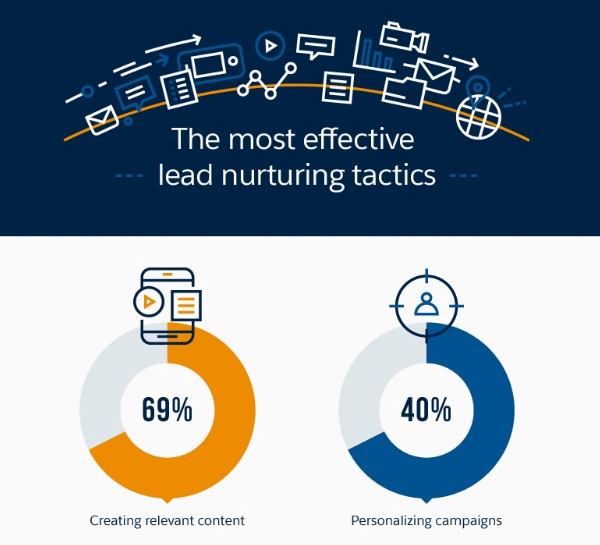 Creating relevant content -- in this case lead magnets -- is hands down the most effective lead nurturing tactic, so if you’ve already got something solid, give it a facelift in time for the holidays and prepare for profits. “What profits?” you ask. I’m so glad you did. How can you still profit from free digital downloads? I get it. When someone says something is free, the idea of connecting it to profits in any tangible way seems counterintuitive at best. Beyond the obvious aspect of getting more customers in the door and ready for nurturing (if not nurtured already by your product), providing a free digital download on your storefront gives you an opportunity for upsells and cross-sells. An upsell is when you offer another related product or an upgrade during the checkout process, often at a discount. 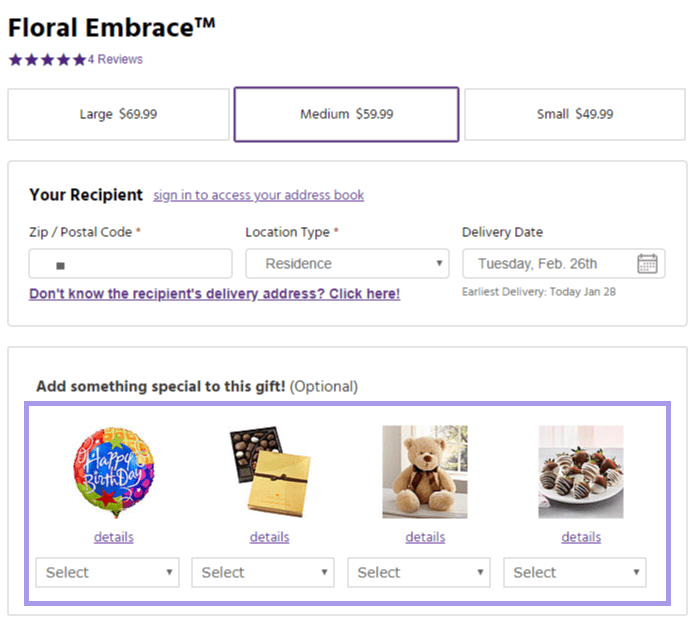 A cross-sell is when you offer a related product during checkout as a package. You see it pretty often with retailers. Here’s an example of a cross-sell-in-progress from 1-800-Flowers. How do lead magnets play into this? Easy. If your lead magnet is well-suited for your products and someone expresses an interest in it, there’s a strong chance they’ll be interested in your other, better products too -- especially if you give them an exclusive discount. That’s not the only way you can use free digital downloads to turn a profit, though. If you use affiliate marketing, either as an affiliate or merchant, you can create lead magnets as opt-ins for your list and use a drip campaign to sell your affiliate products. Alternatively, you could also create free downloads for your affiliates to use as opt-ins. Providing assets for your affiliates encourages them to promote you by cutting out the amount of work they have to do and ensures that your branding stays consistent no matter who is speaking on your behalf. Plus, a shocking majority of affiliates report that less than 25% of the businesses they promote give them the resources and creative materials they need to market their products. So creating a free digital download for your affiliates is a win-win that’ll set you miles apart from anyone else your affiliate works with. However, take care that whoever and however you gate your free digital download, you’re providing something useful on the page and not asking for too much investment from the user. Think of your landing page or sales page for your free digital download as the abstract section of a research paper -- without purchasing the full product, you should be able to see the gist of what the study is related to and its findings. As for how much information you should ask for people, keep it on the light side. If you force users to give more information than they want to access your digital download, you can anticipate getting junk data and cold leads. First, I have a special phone number -- a great rejection hotline -- that I hand out to companies that ask for more information than I want to give to see a download that may or may not benefit me. And second, the statistics say I’m not alone. Convertr, a customer relationship management platform, ran through their own databases and found that 38% of leads were phony. Now, we’ve covered how free digital downloads can you lead to profits -- lead generation, lead nurturing, upsells and cross-sells, and affiliate marketing is just scraping the surface -- but what kind of downloadable products can you create for it? Any product you can sell on Podia, you can offer as a free digital download. That said, some types of content work better as lead magnets than others. Here are just a few to get you started. Do you know what I love? Being lazy. If it were an Olympic sport, I’d at least qualify for the regionals. So when a website offers me a kit -- especially one that delivers value I can’t find anywhere else and promises to improve my conversion rates -- I’m absolutely on board with giving over my email and joining their mailing list. And if you want to pivot on the power of lead magnets, you should consider offering something similar. As for what to include, there are no hard and fast rules -- a kit can include anything from PDFs to image files or even video files. The only metric that a digital download needs to fulfill to qualify as a kit is that it provides more than one resource, even if those resources are in the same file. A sales copywriting swipe file. Access to a sales copy generator. An infographic on the state of the side-hustle. A definitive guide to selling online courses. Tutorials and tools for creating online courses. Could you get all of those things by opening up different tabs? Sure. Would you prefer to have them all nestled and organized in a simple file folder? I would. That model isn’t purely from thin air, by the way. 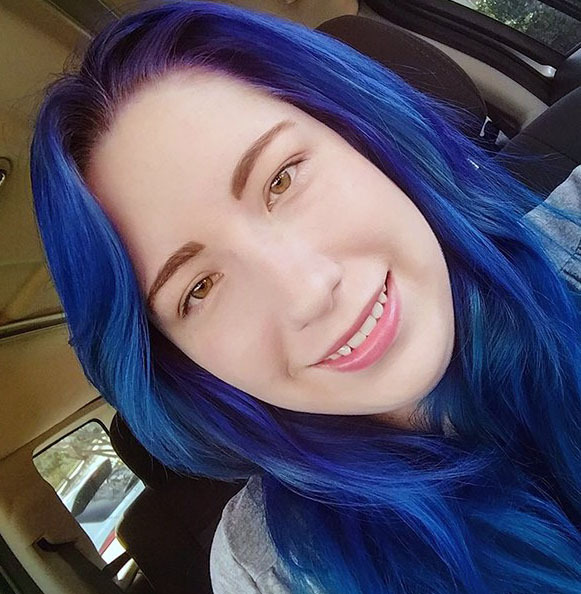 ‍And it follows our “don’t ask for too much information” guidelines, requiring just two data points before we have access to a veritable library of resources. Incidentally, Sleeknote also excels at the second type of free digital download you could create -- the content upgrade. I write walls of text for a living, but not everyone has the time -- or want -- to read through them, and that’s okay. You don’t need people to comb through every line of your blog content to turn them into subscribers. 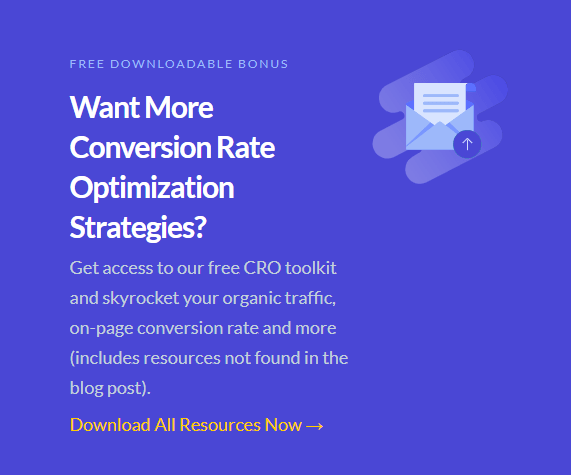 In fact, giving them an easy summary and actionable supplement -- like a cheat sheet, a quick start guide, or printable resource -- can improve your conversion rate significantly. That’s what Sleeknote found when they paired content upgrades (relevant upgrades, in particular) with their blog posts, gaining 28.83% more email subscribers in a single month. As you can see, well-performing content upgrades don’t have to be laborious to create -- they just need to be relevant to what they’re attached to and the audience you’re trying to reach. So if you sell printable templates for nutritional planning, create a calorie tracking cheatsheet for blog readers. Or, if you teach other people how to design websites, put together printable flash cards with jargon terms or important design ratios they might need. You get the idea. Make it easy, useful, and relevant. That’s all there is to it. Unlike the last type of digital download you can create, putting together an email mini-course can definitely be much more labor-intensive, but it can also be a rewarding way to introduce users to your teaching style if you sell online courses. And, it’s a proven technique for creating a healthy email list to sell to. Reuven Lerner, a professional trainer and Podia customer, started his list with email courses and still uses it as a list-building strategy today. Email mini-courses are usually dripped content (something you can do with Podia, by the way), so they’re the perfect intersection of lead nurturing and automation. They convert incredibly well, by the way. 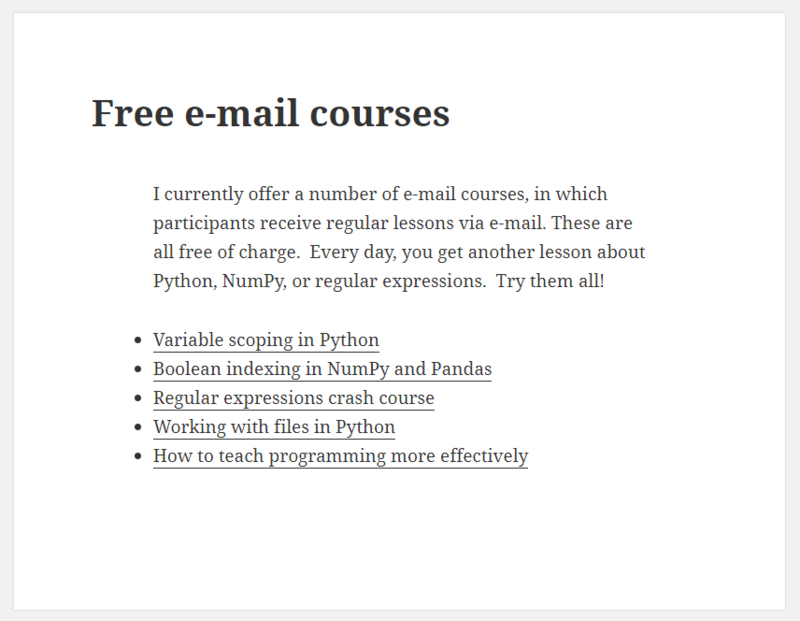 Guillermo Ziegler used free email courses to add 1,700 new subscribers to his list. 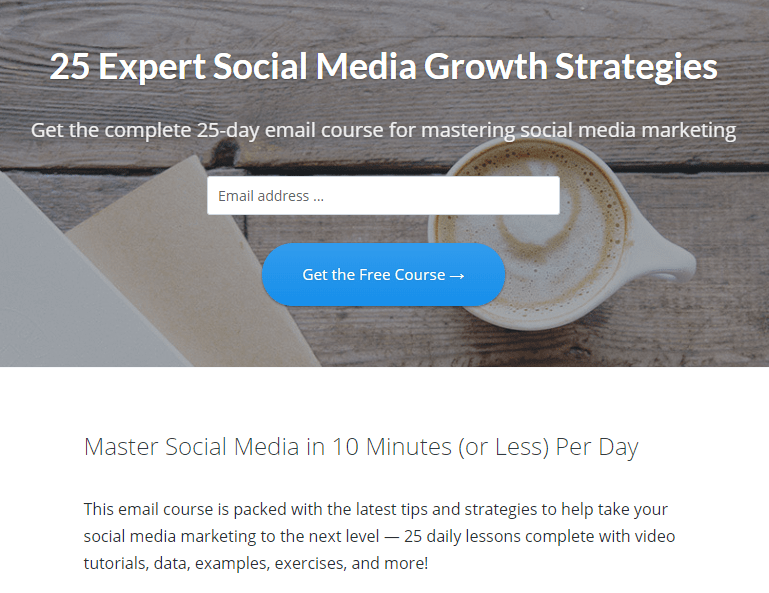 Another educator, Wes Wages, went from zero subscribers to a little under 1,000 subscribers in seven days with an email drip course. And entrepreneurs aren’t the only people to realize the power of an email course. Buffer, one of the tools we use at Podia, offers their own variety for those interested in social media. Since Buffer is a social media tool, it’s perfectly relevant to their prospective customers. 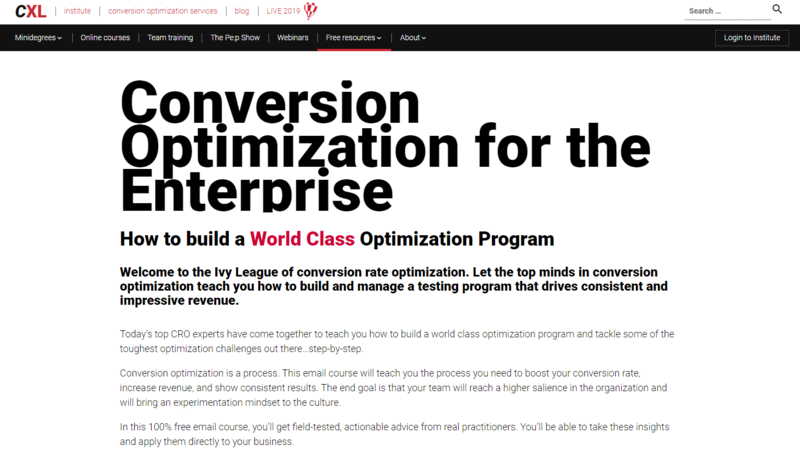 Likewise, ConversionXL, a conversion rate optimization agency and marketing training provider, has an offering that’s downright delectable for its target demographic. 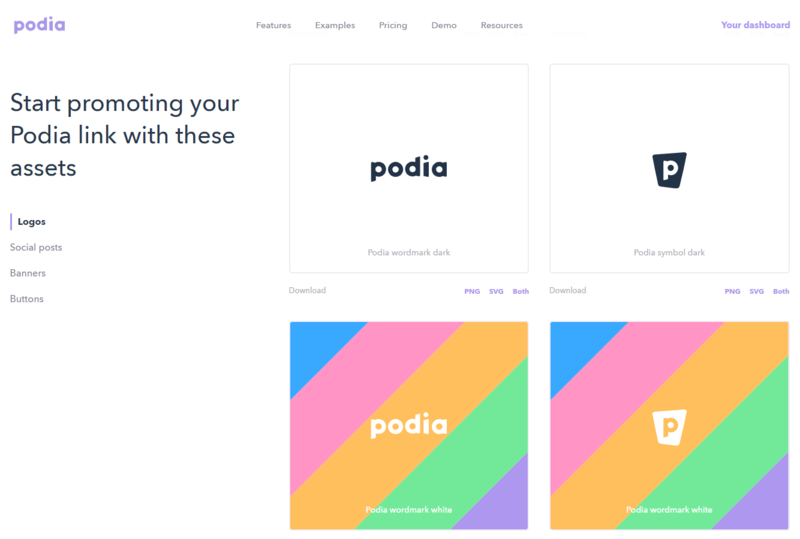 As for delivering your email course, resource kits, and content upgrades, you could wrangle together plugins like Easy Digital Downloads and SendOwl, or you could easy-button it with Podia. How easy button? I could tell you about it, but sometimes, the best philosophy is to ‘show, don’t tell,’ so give it a no-obligation free trial to find out for yourself. And by best things, I mean things that generate profit, improve lead quality, and nurture customers until they’re ready to make a purchase. When you create a free digital download, you’re creating a lead magnet, and as the name suggests, they’re fantastic for attracting leads and bringing them onto your email list. Ideally, you should give away free content year-round by hosting it and offering it to anyone who visits your website or storefront. Eventually, however, you’ll need to change what you offer (or, at a minimum, refresh it). When that happens, use the seasonality of your industry and major shopping holidays as your starting points. Free doesn’t mean “free of profits.” In addition to the previously mentioned lead nurturing benefits, a free digital download is a great asset for an affiliate marketing program -- from either side -- and can be used to upsell or cross-sell your other products. If you’re looking for the types of products you should create for a free digital download, your imagination is the limit. That said, resource kits, content upgrades, and email courses all convert well. And when it comes to delivery, Podia has you covered. Assuming you want it to be easy, anyway. Does creating a free product take time, effort, and billable hours? Yes. But is it without profit? Far from it. 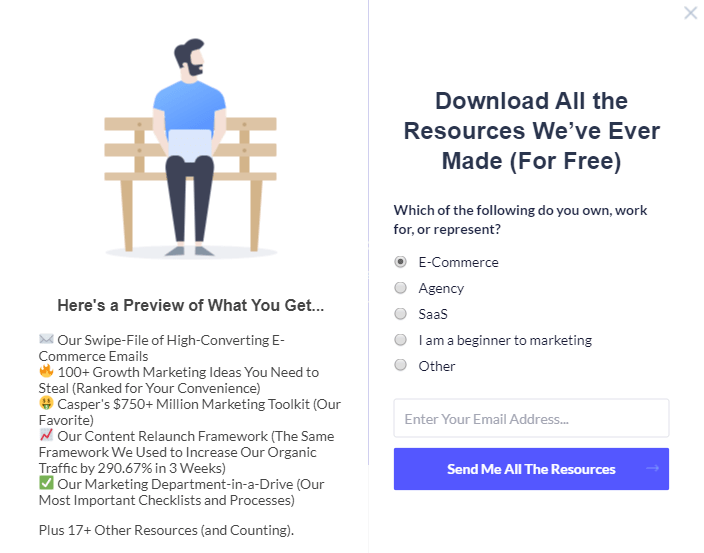 In exchange for a little generosity on your part, you can expect better-qualified customers, nurtured leads, and an email list that's ready for your paid products when you launch. And those are definitely the best things in an entrepreneur's life.